other members on the Volta team will pick up the gauntlet and start blogging shortly too. This post is going to be very short (if you ignore the code snippets) - we've already seen how classes can be split into two, one being the client proxy the other the service implementation - but what happens if a class is used in the client and server but isn't fixed/pinned to run on a specific Tier via the RunAt attribute... that's the focus of this post. 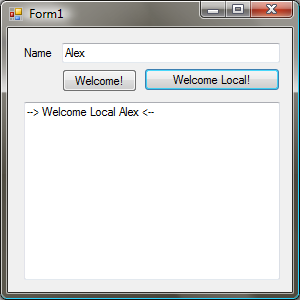 And lastly, I'll add an additional button called "welcomeLocalButton" which when clicked will make use of the helper to format some text on the client, instead of calling the WelcomeMessage method on the service. Compile and run - everything works as expected, now looking at the generated client and server assemblies we see both contain... the same class - yep that's right it just duplicates the class in both the client and server tiers, without changing it at all. So to demonstrate the web equivalent I whipped up the following example - I was trying to think of something interesting that would be useful to do client and server-side - and thought, perhaps I would use Andrew's Inflector.Net - sadly there are a few issues with that, namely Regex isn't supported out of the box in Volta (which is a real shame, this is something I would've have expected to have been in the preview - regex being such a swiss army knife, especially for scripting) - so instead I picked something a little simpler - the Ordinalize functionality from Inflector, and just stripped out the other unrequired methods which would give us grief. So... what's left after the tier-split? scripting is overwhelming and large amounts of asynchronous messages are being exchanged between client and server... at least that's where I see a sweet spot... obviously there are plenty of other side-effects as well (ubiquitous refactoring springs to mind). Now if you scroll down past all the standard (BCL) and volta related types you eventually find... no mention of the Inflector type. No magic here though - just type a value into the textbox and click Ordinalize Local - and flick back to Firebug's console... and you will see a request being made for the Inflector type - types are lazy loaded - makes a lot of sense, when you might have types only required by a single UI element on the screen that the user never touches. At any rate I'm going to wrap it up there for now... work to do, but I have to say for a very early preview Volta is proving surprisingly robust - I really hope in the long term it becomes a product in and of itself, rather then being reabsorbed - to me it's a logical approach to reducing complexity in a lot of what we do today - especially when it comes to embracing the DRY principal. As mentioned on both Darryl's and JB's blogs - in February of next year Chris, Darryl & JB will be touring around New Zealand to tell you all about "2008" (SQL 2K8, VS.NET 2K8 & Windows 2K8 that is) and they're getting "locals" to participate in the various centers, and I just happen to be that "Local" for Auckland, though hopefully not too "Local". So either follow the links above for the full announcement of centers and dates, or if you are local to Auckland then just click on the following link and sign yourself up for the session on Monday February 4th - it's also worth noting that if you both register and turn up (I believe you have to do both ;o) you go into the draw for one of 3 home servers... education and swag. It should be a lot of fun, so register and come along next year! Edit: just noticed Chris has also posted, and included some extra details - so take a look! relationship that exists for a web app. made for each button click. successive button clicks only one request is being generated. So plenty of subjects today, though a small'ish turn-out, kinda goes with the time of year, and is probably also related to the bar camp Agile down in Wellington tomorrow, which I know at least one of the regulars is heading to. Code protection and obfuscation was floated by Garreth - sparked off by his need to find a new code protection production, as the product he currently uses doesn't appear to be under development any longer (.Net Reactor I believe was the product). In fact, it's worse than that - he suspects that the Author may have had an accident or something similar, because the releases stopped a few months back and the Author is no longer replying to questions or queries on the forum, but prior to that was a very active individual - He can't even be contacted by cell phone. Incidentally if anyone reading this knows of the Author or his fate personally, we'd love to find out more. wanted to confirm this with some fellow developers because he's looking into a range of products including PRO-Tector from Nalpeiron that uses this approach, and was worried he might get too much "kick back" from his target customers (i.e. other developers). From there we moved onto obfuscation products - we've talked about these before, including Dofuscator and SmartAssembly which came highly recommended from Andrew @ Mindscape. and undocumented behaviour which you might leverage or rely on which could be broken easily between service packs for even the same version of the product). It takes care of varying Tax legislation etc. so you don't personally need to think about collecting VAT etc. - because they act as a "reseller' for your product. Supports non-electronic processing i.e. Cheques, purchase orders, direct debit etc. Entirely customizable UI, can be entirely gutted and made to look like your own site. It understands selling Software and digital content, and provides call backs so you can integrate custom license generation etc. Within the payment site and provisioning workflow. It could be just the ticket if your thinking of selling some software and don't want to completely roll your own solution. Next I ran quickly through the various product announcements etc. over the last 3 weeks - We pretty much bypassed everything and headed straight to Silverlight 2.0 and Volta (VS2008 is old news already, though the Isolated VS2008 Shell got a mention, however most were shocked at the size of the redistributable component - 315MB - that's a big ask if you want to leverage it for a simple product/project). I was also hoping to get back to talking about the ParalellFX CTP which I've also been playing around with - but never got the opportunity. hot little hands which can be played with - I took it for a test drive this morning, and miraculously it works!? 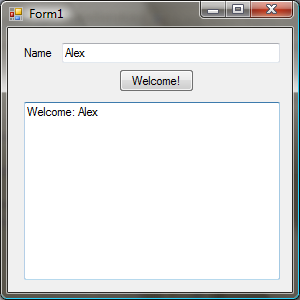 appealing to existing win forms developers who have resisted until now from engaging a web platform, because it feels very "familiar"). state I think it could do a pretty good job of converting some winforms apps I've built in the past, short of re-implementing complex visual controls. Introducing additional tiers i.e. 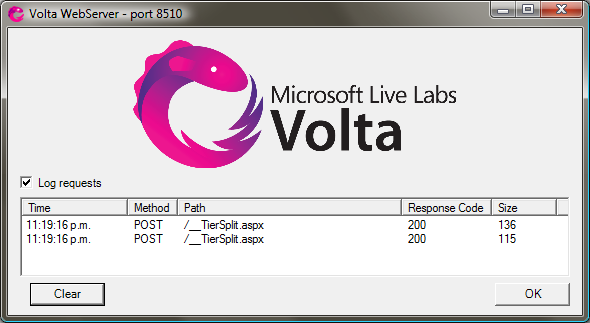 tier splitting between an application server, webservice and client script (not sure this works when using Visual Studio at the moment - the release notes suggest "no", so will probably require some spelunking and command line compilation at this stage. We talked about Silverlight 2.0, its release date (probably near the end of Q1 2008) - and just what ships and what doesn't i.e. is there a compiler and does it live on the server, extensible control model, 2-way data binding etc. Certainly Silverlight 2.0 is looking very comprehensive, and the Silverlight team look to have been/are very busy (I wonder how on track the Moonlight team are, considering the surface area of things to develop has grown somewhat from the original 1.1 scope). and being consumed by your application, or a Visually depicted DSL, ah-la Microsofts DSL SDK for VS.Net. In the same conversation we also talked about operator overloading, making things explicit, avoiding operators all together (i.e. "A == B" is far less meaningful in relation to a domain specific language then "A.Equals(B)" or even better "A equals B" - i.e. being terse may prevent your DSL from being explicit enough to be read by the people who best understand the domain language and the concepts it's modeling to begin with. of spaces is a lot nicer to read then opening/closing braces and associated visual noise - and it's easier to show the raw code to clients when discussing problems because it's less confusing). From there we branched into discussing multi-language projects - i.e. why do we need to have separate languages in separate assemblies... a lot of us fondly remember the old days of in-line assembler, and would like opportunities to use a language like F#, Boo or one of the DLR based languages in-line within a C# or VB.Net project - i.e. within the bounds of a function/method... I see F# pattern matching as a great example of where this would be really handy - same goes for embedding your own DSL's in-line, or even leveraging a few lines of concise ruby code to do some string manipulation. I suggested a compiler model much like Boo's would work well in allowing this to happen - though there are issues with just how you compile it, approach merging the separate chunks of IL etc. and cross-referencing. PDF file parsing got discussed - there is a binary and text based standard (which is largely human readable) - Peter suggested that ABC PDF is very good at pulling apart PDF documents for information extraction in the Enterprise edition, and also supports CMYK colour, useful if you're working with professional printers. Because there isn't much metadata stored in many cases, you often have to rely on specific style information to identify key bits of content. high-level organizational model of past, present and future systems (including when certain systems are going to be retired), all the way down to individual applications, business processes, use cases, test scripts/runs, classes, unit tests, machine inventories and even live application data that can be used to be make decisions... even as a develop this has real value, i.e. integrating with a system you could identify how many systems integrate with it, when it's due to retired/replaced/upgraded, maybe how many transactions it's processing, or how often it refreshes itself with key business data from other parts of the organization. I saw a nice example of this just last week at the EA Symposium presented by IAG. It's definitely a subject I'd like to visit again in the future, and perhaps we can get one of the NZ experts in this field to come and participate such as Lukas Svodba (who also runs the arcast.co.nz site) - this also ties in with MDA and MDG, The later of which I'm still having difficulty reconciling with a largely agile test driven development process. Also on that note I mentioned the JetBrains meta programming system and wondered if it will ever reach a v1 status, I had high hopes for it a couple of years ago. It doesn't seem to have had much activity associated with it over the last couple of years (I almost wonder if it was largely an Idea which was well before it's time for a lot of the .Net community, that are only now starting to appreciate DSL's and considering working/developing at a higher level of abstraction - or lower level if you look at it from the perspective of the problem your trying to solve i.e. closer the metal of the problem domain itself). Big thanks to Alex James (Meta me) for getting this chat off the ground, and thanks to all the regulars who come along every fortnight - you've all helped to make the Architecture chat one of the most successful and interesting recurring events I've had the pleasure of attending/participating in - and it's been great to have been able to swap ideas and information over the last year. Have a merry Xmas and a happy new year one and all! Well this blog, the wiki and all the other associated services disappeared for most of today... thanks to the magic of NoAuth ... for no reason that anyone could explain to me beyond "it sometimes happens" - Orcon lost Authority over my business DSL connection, and it reverted back to Telecom/Xtra (New Zealands "legacy" telco)... and it took must of today for them to get the authority changed back, I don't think this was any fault of Orcons, but it still pissed me off no end. So apologies to anyone wondering where my blog went, or any of the related services - I do have plans to migrate the blog to US servers in the not to distant future. And big apologies to all the Architecture chat participants, sorry I couldn't get a reminder email out sooner. On a different note - It did identify a need for me to maintain a secondary connection, with a static IP, that I can fall back to if required... thankfully the three concurrent projects that have been in UAT over the last couple of weeks have all wound down now - so it didn't have as much impact as it could of. ... so any suggestions as to what would make an adequate fall back technology (something other then DSL, I've used wired country two-way-radio to the sky tower in the past which has worked well, but it doesn't give much "bang" for buck and has a high up-front cost last time I checked) ... I'm not too worried about 1 day downtime, but if this had been 3 or 4 days it would've been quite damaging for me, customers and those intangibles like reputation. At any rate - thanks for the patience, and I'll see some of you at the Architecture Chat tomorrow.